A thermostat has a big job. As a closed loop control device, it senses the temperature in your home to maintain it at the set-point you indicate. To do this, it measures the thermal expansion within the unit and switches heating and cooling equipment off or on. The small device has a large role in your comfort and energy consumption, and believing some of the misconceptions about programmable thermostat use may translate into higher power bills. Myth 1: Setting a thermostat to heat or cool your home while you’re away will save money. Some individuals believe that adjusting the temperature on a programmable thermostat so it’s lower while they’re away to reduce energy costs. They think that the heating or cooling system will have to work harder to reach the desired comfortable temperature when they return home and, therefore, waste energy. The U.S. Environmental Protection Agency states that you may save up to 1 percent on your energy bill for every degree that you adjust the temperature on your programmable thermostat if the setback period (the time that you’re away from your home) is eight hours or longer. The savings may be even greater if you live in an area with a mild climate. Myth 2: Setting the thermostat to a much hotter or cooler temperature than you want will help the system reach the comfortable temperature you desire faster. Some people hold the belief that if you want to heat your home quickly, you should set the thermostat to the highest temperature possible because the HVAC system will blast hotter air. They may also believe that setting an air conditioner to the coldest setting will cool a room faster. The truth is that HVAC equipment does not work in this manner. It heats and cools at a uniform rate, regardless of the temperature you set. The only things you will achieve by setting the temperature hotter or colder than you really want are discomfort and a higher power bill. Myth 3: If the temperature in your home isn’t correct, the thermostat is broken. Older thermostat models may have corrosion or loose wires that could cause them to malfunction. 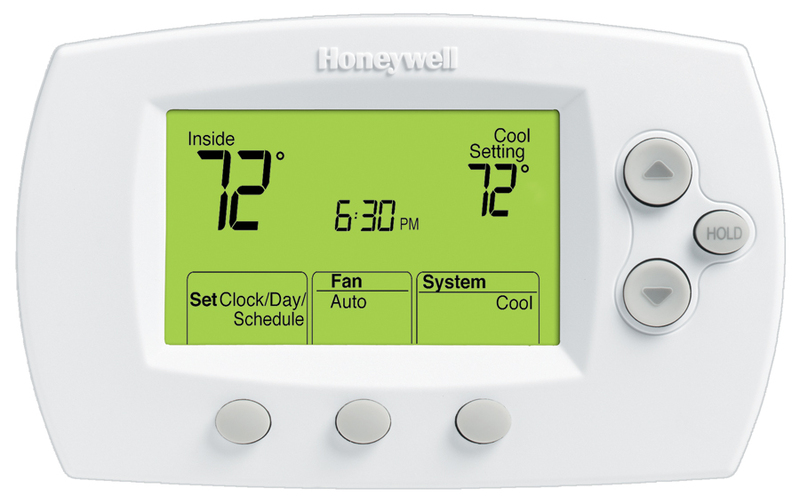 If the thermostat is outdated, it is a good idea to replace it with a new programmable thermostat. The programmable thermostats available today feature logic-driven, intuitive designs that make it simple to control your HVAC system and the comfort levels in your home. They allow you to program the temperatures in your home for when you are awake, asleep and away. Depending on the model, you may program every day of the week or run a different program for weekdays and the weekend. Because of the set-it-and-forget-it features, a programmable thermostat raises and lowers the temperature in your home, according to the times you set, so you never have to worry about remembering to adjust the device. The convenience also yields energy savings. Many models offer bypass settings that make it simple to increase or decrease the temperature in your home for a short period without the need to reprogram the device. During your annual HVAC maintenance visit, a specialist will inspect your thermostat to ensure that it works properly. If you have questions about how to use your programmable thermostat to maximize the comfort in your home and save energy, or if the device does not seem to work properly, get in touch with AAA Heating and Cooling. A specialist will gladly assist you and help you determine the best solutions for your needs.